This versatile, transitional kid’s twin over full bunk bed, designed to work for a boy or a girl, can adapt to any decor as they grow. 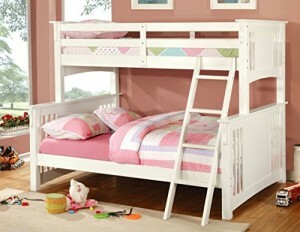 Made of durable solid wood construction, our beautiful bunk bed will fit well in any youth bedroom décor. Twin/Full bunk comes in 3 color options: Espresso, Dark Oak, and White. Product Made in China. Assembly Required. Once Twin/Full bunk measures 80.88–Inch wide by 61.75–Inch deep by 65.13–Inch high; 30-days hassle-free replacement parts warranty. All decor items are not included in this offer unless specified.